GARDEN GROVE, Calif. (CNS) — When Teresa Alvarado was growing up as one of 13 siblings in a modest home in Jalisco, Mexico, tragedy struck suddenly and upended their lives forever. Her father’s lifetime of work literally went up in smoke when the family’s small shoe shop — and only source of income — was destroyed in a fire. The years that followed were a never-ending struggle to try to make ends meet. Finally, at age 57, her father, Miguel, and her older brothers immigrated to Los Angeles seeking work to help support the family of 15 — a heart-wrenching choice that left behind Teresa, her mother and the rest of her brothers and sisters. After more than a decade of factory work in the states, Miguel and his sons were finally able to bring the rest of the family to the U.S. in 1975, Teresa recalled recently. Five years later, after a tremendous amount of “work, sacrifice and savings,” Teresa’s family opened Northgate, a small neighborhood market in Anaheim — and subsequently the “gates of the North” opened up to the Gonzalez family. The business has since surpassed her father’s original dream of someday having one store for each child; today, they have over 40 markets in California and Arizona. Alvarado was among hundreds at the second annual Immigration Summit sponsored by the Los Angeles Archdiocese and several other Southern California dioceses and held Feb. 27 at the Orange Diocese’s Christ Cathedral in Garden Grove. Titled “Hosting the Immigrant: A Call to Action,” the summit served as the official launch of a multi-diocese, parish-based initiative to help legal permanent residents obtain their U.S. citizenship. According to statistics from the Department of Homeland Security, there are currently an estimated 2.4 million men and woman eligible for naturalization in California. Over 400 parish and community leaders from across the Archdiocese of Los Angeles and the dioceses of San Bernardino, Orange, Fresno, San Jose and Monterey were on hand for the summit, which was held concurrently with the 2016 Religious Education Congress at the nearby Anaheim Convention Center. During the summit, Alvarado, other immigrants and refugees shared touching personal testimonials, and religious leaders — including Los Angeles Archbishop Jose H. Gomez, Los Angeles auxiliary bishops, retired Auxiliary Bishop Dominic Luong of Orange and retired Auxiliary Bishop Rutilio del Riego of San Bernardino — discussed the importance of the initiative. Before the end of the summit, participants were encouraged to chat with one another for a period of time to share ideas, exchange contact information and discuss plans to help facilitate upcoming caucus/training sessions for parish teams, which will conduct information workshops for legal residents seeking citizenship. Benefits include the ability to vote, eligibility for public services, citizenship for minor children, no risk of deportation, eligibility for federal jobs, and more. 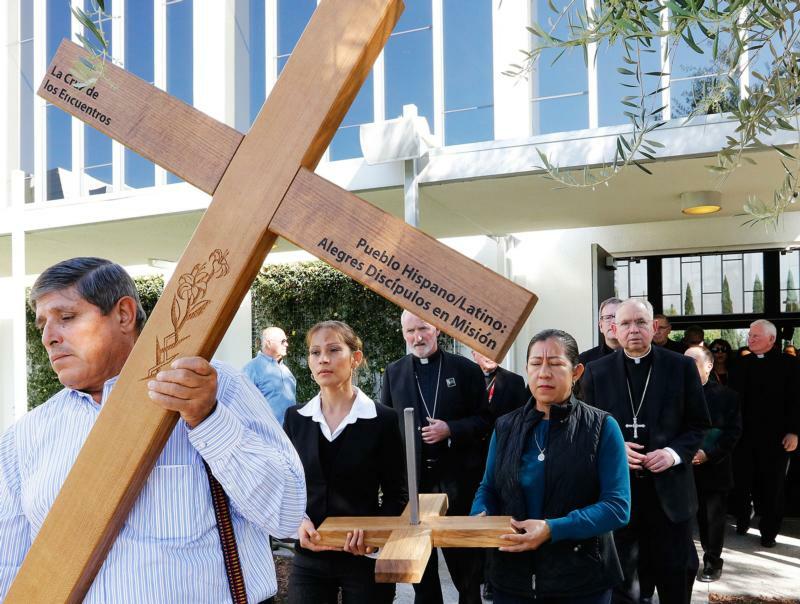 The summit closed with a “Migrant Stations of the Cross,” with attendees exiting the conference area, processing behind the Encuentro Cross and entering a separate cathedral building to view a display of crosses representing the suffering and lost lives of countless migrants crossing the border. Among the “stations” were select personal belongings that have been found along the U.S.-Mexico border. The new parish initiative is part of Catholic Church’s ongoing support of comprehensive immigration reform; is a response to the pope’s call to action during the Year of Mercy; and brings together the California Catholic Conference of Bishops, Catholic Charities and the participating dioceses for a coordinated effort. Torres writes for The Tidings, newspaper of the Archdiocese of Los Angeles.